It’s noticeable at first sight that this saloon isn’t from Europe. Its robust chassis, massive curves, aggressive design – these are classic signs of American approach to car’s design. This car shows its power and big bunch of self-confidence. It’s really the Dodge car. 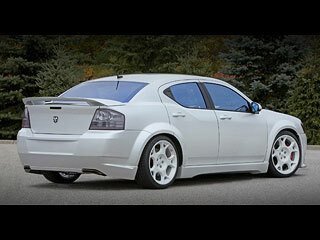 The manufacturer addresses the Avenger to people searching for medium-sized automobile that has also a great history and legacy of muscles. No doubt it will be successful. Nobody can doubt of combination Dodge and power. 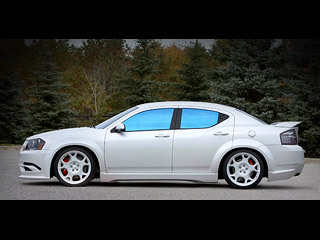 Dodge has been also well known for its not small engines with great performance. And also today it’s characteristic for this brand, of course not in Europe, where gasoline isn’t so cheap and local people like diesel too. The Avenger has same „European“ destiny. It offers three petrol engines with the most powerful 3.5 liter V6 producing 235hp (173kW) that’s not very suitable for European prices. So European dealers offers still attractive 2.4 liter 4-cylinder „World engine“ pumping 170hp (127kW) at 6000rpm that can roll all four wheels. But if you want, you can still have the more power American version :-). This tuning work radically changed the Avenger. Its massive look is still magnificent, but the car looks different, in good sense. You can see why it’s called Stormtrooper, because it resembles troopers from Star Wars series wearing similar white futuristic „armor.“ It’s really interesting, but it’s not really for everybody. Anyway, it’s an American „muscle“ car, so this future wardrobe looks OK. The first and most distinctive change is a new complete bodykit. So it’s beginning with its front part with an atypical front bumper. It includes three weird Star Wars-like openings. Two sides openings has typical sharp edges and their connected with a distinctive crossbar all over the bumper. The bumper includes also a spoiler that makes it all bigger. It’s very unusual piece, a combination of sporting and futuristic and it’s good that it’s placed on this vehicle. The Avenger has now better lights – Umnitza predator „angel eyes“ with dark reflectors and xenon lamps. That makes very nice mix of snow-white paintjob and dark lamps. Next modification is visible on the sides. Guys have installed new side sills that can be called „stone“. It’s strange, but they have another feeling than other ones. They look robust and they have boxy shape. But they match with the Avenger and of course they are new muscles for this beast. ZAnother interesting feature is whole fuel system including tank camp that comes from Dodge Challenger. You definitely notice a magical PPG tinted windows and also exterior mirrors. Safety first. The rear part of the car has been changed radically to its new interesting look thanks to the new rear bumper. Its distinctive sporting lines enhance the car’s elegant spirit. A pair of weird Borla exhaust tips can be found in a diffuser. The Avenger’s stock rear wing has been replaced with a new inspired by the predecessor. Also pure tail lamps have been tinted to match with the rest. Almost everything has new wardrobe – from dashboard, doors, central console, specially shaped steering Wheel, through shift knob, pillars, Charger SRT8 sporting seats etc. They’ve used materials such as nice dark Alcantara or leather upholstery in red/black/white with red stitching. The Avenger’s multimedia stuff is more interesting. The dashboard has now three new additional Mopar Performance gauges. And everybody who loves American cars knows that Mopar is one of the best. And now something crucial – a pair of mobile Azentek PCs with 1.8 GHz CPU Intel Core Duo and 2GB of memory installed in the dashboard and between rear seats. This system has some very nice advantages. You can play games, watch movies or listen to music, but also connect with Mopar Performance and order new parts or tune your engine online. Smart stuff. Also you can connect with Dodge headquarters and download technical service bulletins to check parameters, communicate with servicemen or owners of Dodge vehicles. The system has Bluetooth, so there’s no problem to connect other devices such as PDA, cell or MP3 players. Nice amount of music power is delivered by Kicker audio system. So let’s move to the last chapter – engine improvements. Its stock engine is quite powerful and minor improvements wouldn’t make any important improvement. So it has been replaced and now there’s a bigger and stronger engine from Nitro R/T. It’s the 4.0 liter V6 engine producing 264hp (194kW) and 359Nm connected with all four wheels and 6-speed automatic transmission. There’s a new KW suspension adjusted to optimal sporting characteristic without loss of comfort. More power needs better brakes, so they’ve installed sporting brakes by StopTech with 6-piston brake calipers in front and 4-pistons at the back.